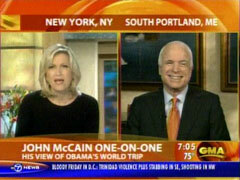 "Good Morning America" co-host Diane Sawyer on Monday quizzed John McCain on whether the media is gushing too much over Barack Obama's Middle East trip. She then proceeded to cite Obama talking points on the visit. First, Sawyer wondered, "A quick question about the press coverage, if I can. [Obama's] there with a lot of reporters and it's been widely reported--" At this point, the Arizona senator started chuckling to himself. A surprised Sawyer continued, "You're laughing. Do you think the press coverage is unfair?" McCain wryly responded, "That's up to the American people to decide, Diane. It is what it is." A few seconds earlier, Sawyer appeared to preemptively answer her query on media bias. The ABC journalist prompted, "You have criticized Senator Obama in the past for not going to Iraq and getting a fresh assessment. He is in Iraq as we speak this morning. Does this take care of it?" The subtext of the question sounded very much like "He went to Iraq. Will you leave him alone now?" Never mind the fact that McCain has been to the area eight times and Obama only two. MCCAIN: It's not just a matter of troops. It's a matter of our relationship with Pakistan. It's relations with a new strategy which will-- can and will succeed. The same kind that worked in Iraq, which he has rejected. And we can succeed there, but, it's going to be tough. MCCAIN: Oh, I don't know exactly-- run through the vocabulary. But it's a very serious situation. But there's a lot of things we need to do. We have a lot of work to do and I'm afraid that it's a very hard struggle, particularly given the situation on the Iraq/Pakistan border. And I would not announce that I'm going to attack Pakistan as Senator Obama did when he was-- during his campaign. But most importantly, he railed against, voted against and said the surge wouldn't work. He said it wouldn't work and couldn't work and has failed to acknowledge. It did work and we have succeeded. Thank God. SAWYER: I can't let you leave, Senator McCain, this morning, without making one more valiant attempt at the vice presidential question. Can tell me anything new about your timetable and how many people on your list now?